EFs display monocyte chemotactic activity. Human monocytes were isolated by elutriation, and chemotaxis assays were performed in a modified Boyden chamber. (A) BALF from smoke-exposed mice (2 months) was used as the chemoattractant. Data are from a representative experiment performed in triplicate. Net monocyte movement = total monocytes – media control (= 40). Bars represent SEM. *P < 0.01 vs. control. 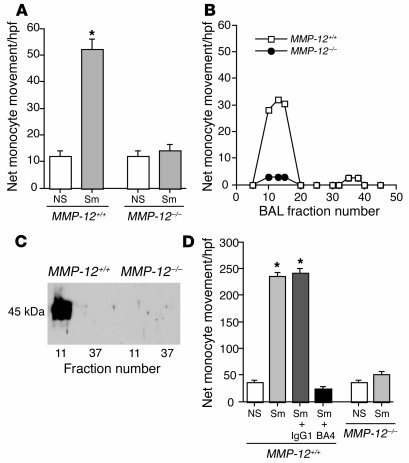 (B) The BAL samples from MMP-12+/+ and MMP-12–/– mice were subjected to gel filtration. The fractions were tested for monocyte chemotactic activity (control activity with PBS alone = 0). (C) Western blot was performed against gel filtration fractions (nos. 11 and 37 shown here) using a polyclonal anti-elastin antibody. A 45-kDa fragment in MMP-12+/+ active fractions was detected. (D) The assays of monocyte chemotaxis were repeated using lung homogenates from mice exposed to smoke for 2 months as the chemoattractant. BA4 and IgG1 preimmune antibodies were used at a concentration of 50 nM. Data are from a representative experiment performed in triplicate. Net monocyte movement per high-powered field = total monocytes – media control (= 46). Bars represent SEM. *P < 0.01 vs. control. hpf, high-powered field; NS, non–smoke exposed; Sm, smoke exposed.